A common staple of the Living Greyhawk campaign was the PC table tent, a folded piece of paper or card stock with the name of your PC. Players would sometimes adorn this with images and catch phrases, as well as titles earned through play. 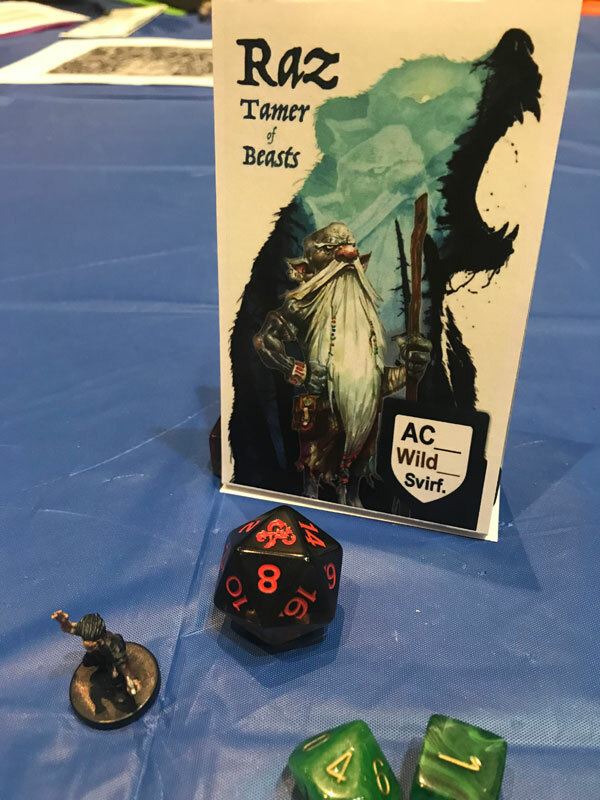 You can see an example of a super simple table tent I made for the characters in my Tomb of Annihilation home campaign, with custom Inspiration rules on the back. Table tents are a huge benefit to RP. When the DM and other players know your PC’s name, and can see it constantly, they are more likely to use it. With the whole table using table tents, everyone can stay in character as they speak to each other. 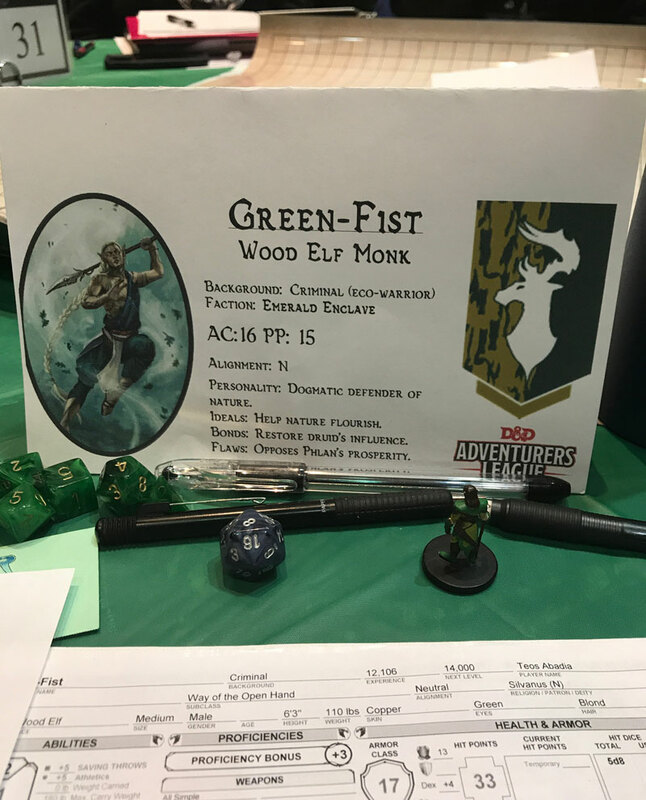 Including your race and class makes it easy for anyone at the table to interact with you more easily, which is a huge boon at convention games. Using table tents also helps the DM, who can now more easily have NPCs refer to PCs by their actual character names. This is a big factor in influencing how in-character the table stays as they play. 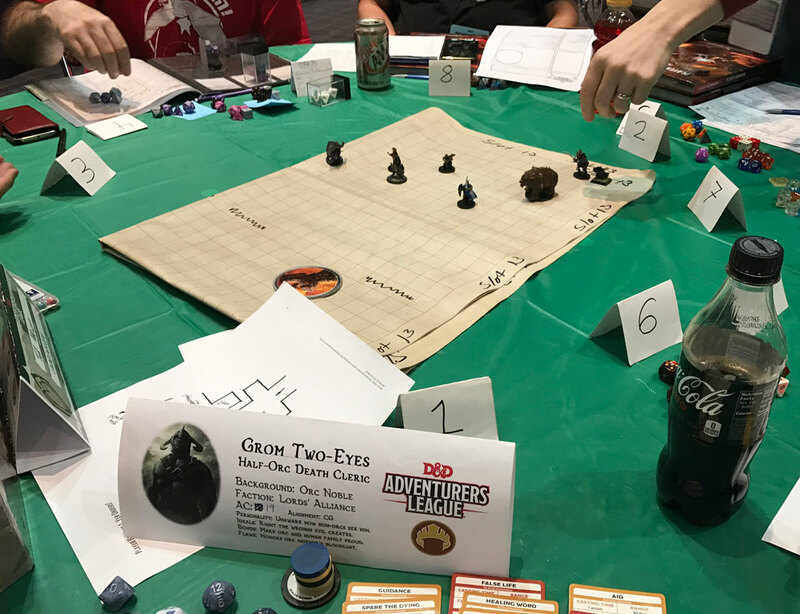 A DM can use table tents to really keep the action focused on the PCs as people rather than as minis moved about by players. There is a lot you can do to create a cool table tent. You can build your tent in landscape mode, so it’s long like the one shown above. Or, you can create it in portrait mode to go taller and take up less table space (as with the Green-Fist tent). You can even create smaller versions and full-color versions for dramatic effects (see the Raz table tent below). The table tent can be a nice place for a quote or a title explaining what your PC is about, conveying some RP. You can also add something that the party should know, such as party-buffing benefits (such as for a 4E warlord) or even something you need (a rogue in 3E could advertise they need flanking). 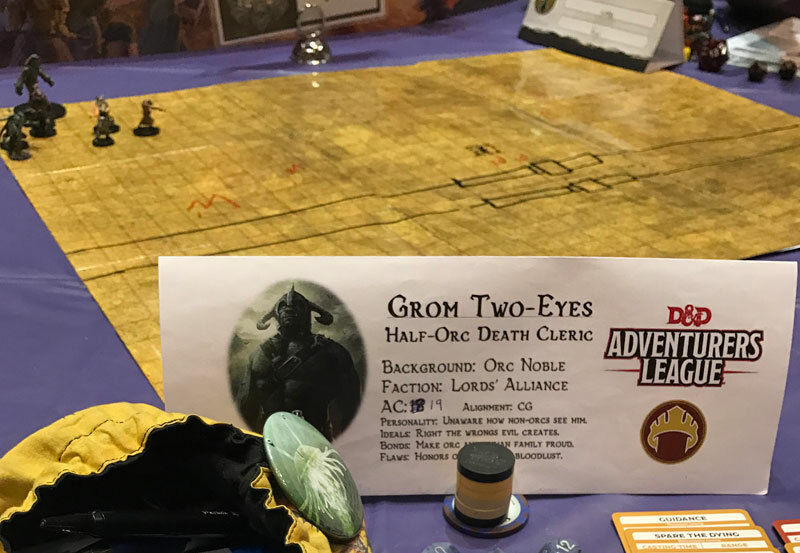 Update: You can download Adventurers League table tents I made here, originally for the Going Last site. Download and change the image and text to be whatever fits your PC. You can find lots of images online – the WotC galleries are a good source as well, especially the galleries for the PH and Power books. Initiative Tents were the invention of Paul Lauper Ellison, a friend and gamer I met in the DC area during the Living Greyhawk organized play campaign for 3rd edition. Paul developed the concept as a way to speed up play, shaving off important minutes during special events where success was paramount and we didn’t have time for the DM to figure out who should go next or whether a PC or monster had been skipped. I carry a stack of initiative tents with me to every convention, and by the end of an adventure the DM has often switched to this method. It is now common to see it in use at major gaming conventions because it is such a good system for tracking initiative. 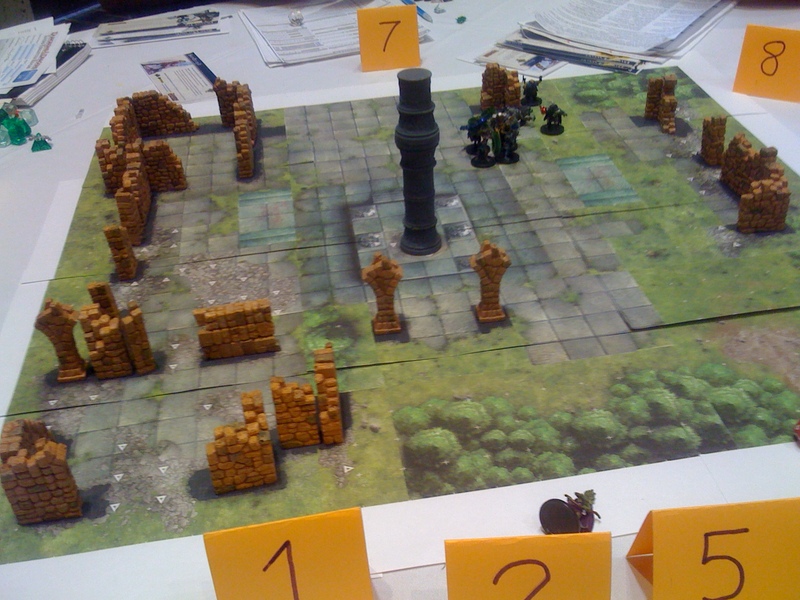 Table Tents and Initiative Tents can fit nicely on a gaming table, even when you have complicated terrain. The key benefits of initiative tents are speed and awareness. The players can see when their turn comes up. They know who goes next and when the monsters go. This lets them accurately prepare what they will do and to know when their turn will come up, so play speeds up. Another key benefit is transparency and fairness. The monsters know when everyone will go and the players know when everyone will go. This has several important effects that are beneficial to the game. Now both PCs and the DM are on the same footing with the same knowledge. In addition, because everyone clearly sees the order, the chance that anyone’s turn will be skipped is extremely low. 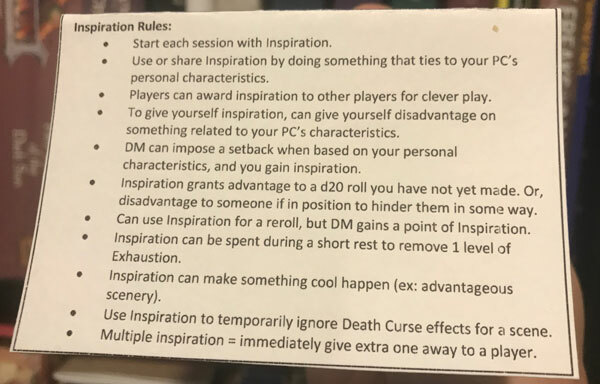 A DM will practically never skip a player’s turn because that player is ready for their turn and will notify the DM immediately. The only possible downside I have found is that delaying and readying can require some tent shuffling. However, I am impressed at how easily the players do this. Sometimes players will just move the tents on their own, before I even look up from the adventure to do it myself. To make the tents, just cut up some card stock (colored is nice) and put large numbers on them. You will want from 1 to 12 at the least. I haven’t gone over 12, but I have used 12 tents. Beyond 12 I would likely just group some monsters together. 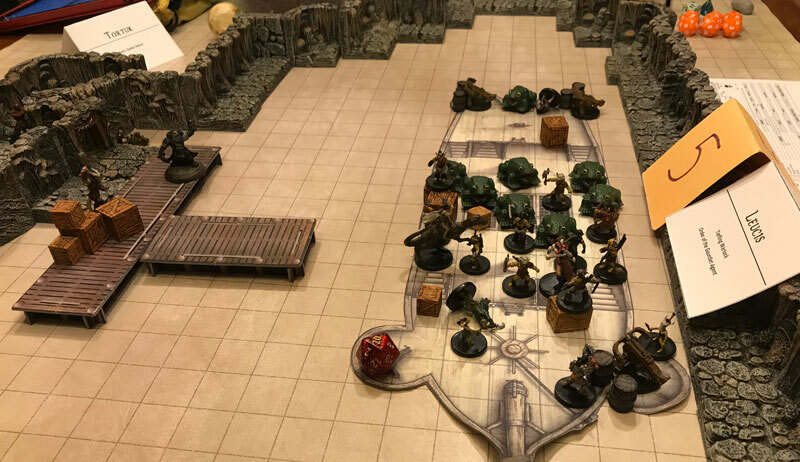 The DM’s area gets a bit crowded with more than 5 mini-tents, but this is also about as often as you want to see DMs go anyway – group similar monsters together so they go at the same time. 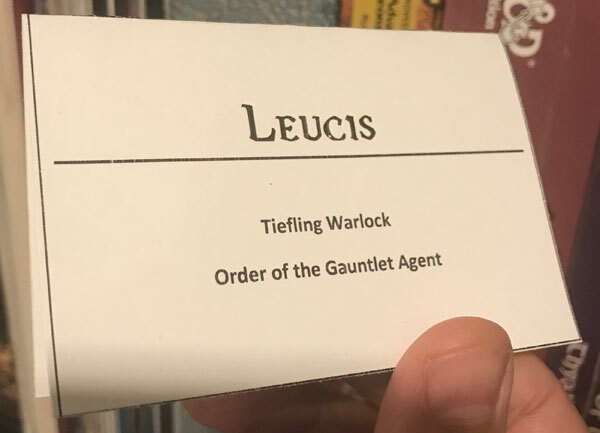 Some DMs (especially in home campaigns) will take cards with the PCs’ names on them, and then arrange them in order along their area. This is fine, but you need small tents to make this work. I prefer the numbers, especially for organized play campaigns and convention games. This entry was posted on October 1, 2015 by Alphastream and tagged 4E, 5E, Conventions, Forgotten Realms, Pace, Props, Tactics.